With the bubblesheets, click on the “Grading” tab. 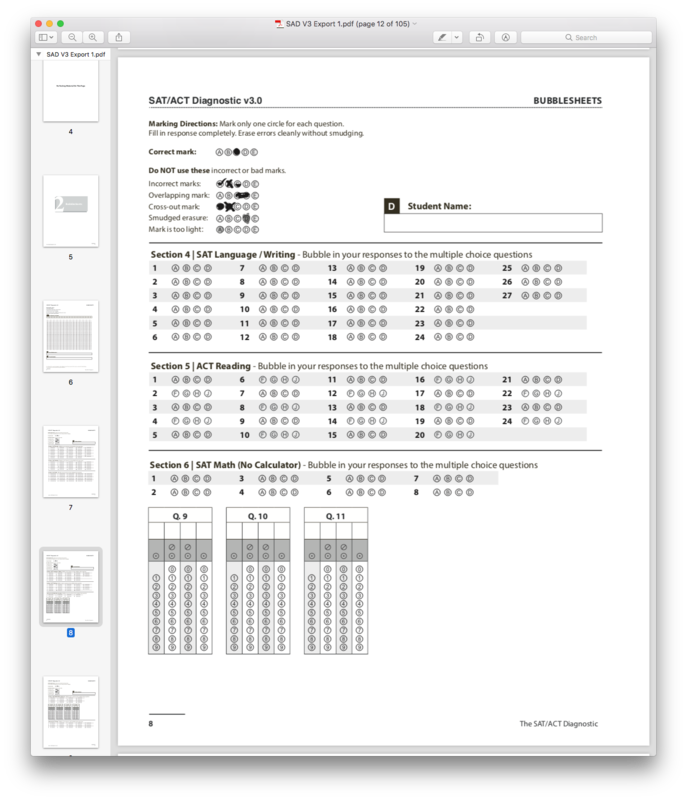 You must select the appropriate version of the test and then download the template. Save your file (keeping it in CSV format); we recommend adding that day's date to the title (eg. "diagnostic-template-3.0-9_26_18"
Click “Select File” and select the file that you just saved. Click the “Upload Answers” button. 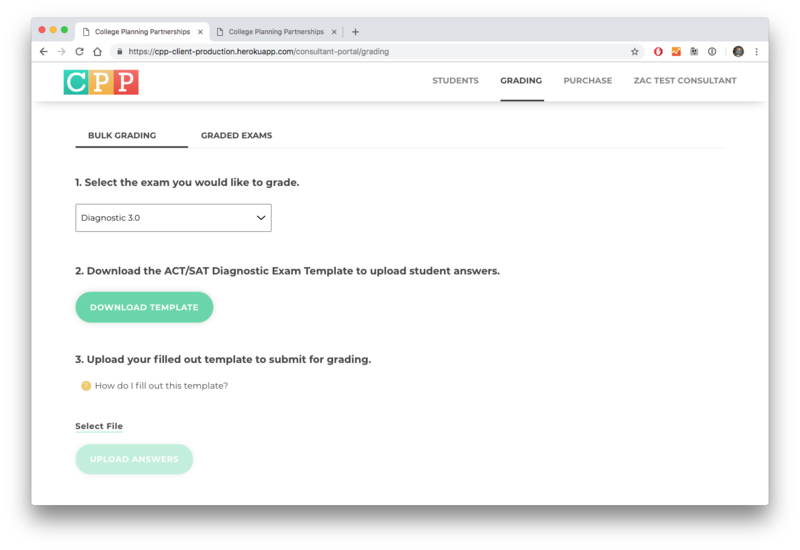 Once the app finishes grading the tests, you and your students will be notified via email and can then access the results. Once finished, students can access their results immediately. You will be notified via email that the student has completed that exam, and you can then view and print the student's results from your account. 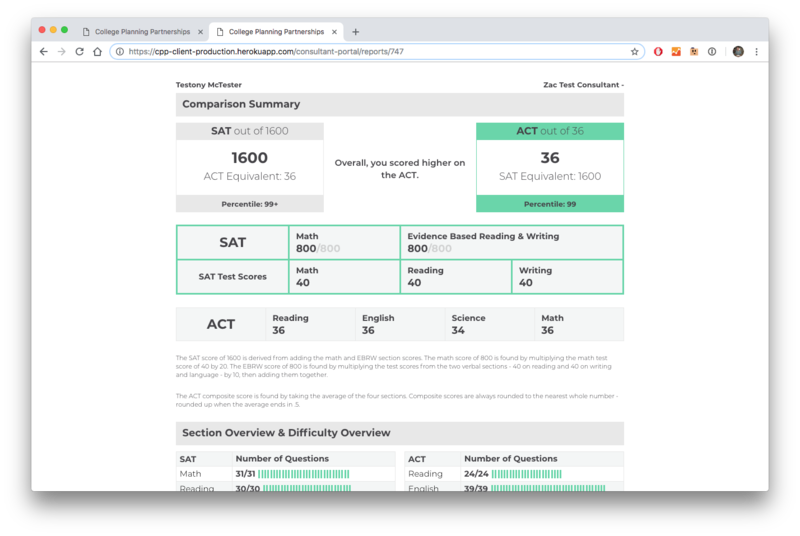 First, your student should complete the SAT/ACT Diagnostic on paper and fill in their answers on the provided bubblesheet. Students can do this at your office or at home, but you must have their bubblesheet (in-person, via email, fax, etc.) before you can proceed. Can I Stop Emails From Being Sent to Students? Yes. When filling out the spreadsheet, enter your normal address, but add something unique to it with a plus sign. So if your email is mark@example.com and you are grading Lisa Smith's exam, enter the email as mark+lisa_smith@example.com. Each student needs to have a unique email (which this is), but ALL notification emails that would have been sent to the student will now be sent to the mark@example.com domain (as long as the service is using a Google server). Fractions Keep Being Entered As Dates....What Gives? This is done by default in Excel, but there are two ways around it. If you are only entering a few results, you can put an apostrophe before the fraction, like this '2/3. The apostrophe will disappear and the value will be entered as just 2/3. 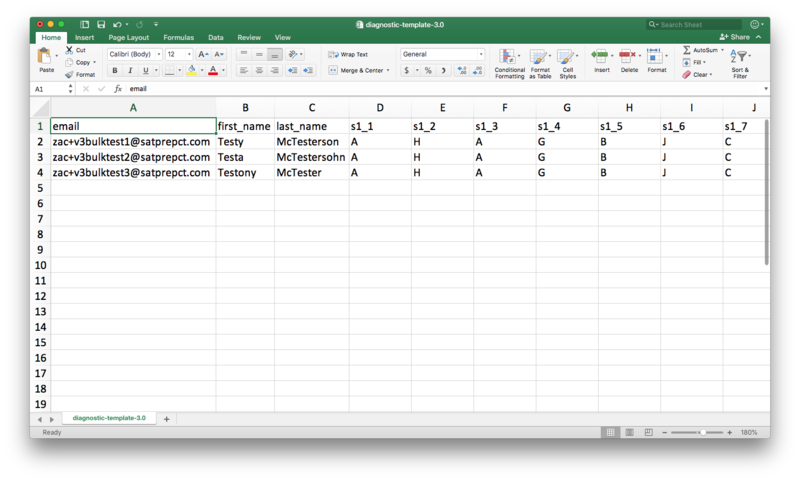 Alternatively, if you are processing many diagnostics, you can format all cells in the document as "Text," instead of "General." This will force 2/3 into a fraction instead of date, with no apostrophe needed. Why do I Keep Getting an Error When Trying to Upload a Spreadsheet? Most likely this is because there was an error in your original file, and you are trying to upload it after the edits have been made. The file upload system is very finicky at the moment, and will always revert back to the first version of a document that is uploaded. If you make any changes to a document before it's uploaded again, you will have to save that file as a different name. We recommend saving files with _1, then _2, etc. if need be. This will be fixed on release. Can I Fix a Typo Made While Entering Results? For answer responses, not at the moment, so be really careful. If you spelled a student's name incorrectly, contact us and we will change it for you.